What do you get when you combine 2 vans, three airplanes, one taxi and 23 hours of travel time? Two tired gringos gasping for air at 13,000 feet and the view of a lifetime. Hello, Bolivia! We arrived in La Paz at 5:00 am, slightly out of our minds having had no sleep on our flight from Miami. (Did I mention the seats were designed for a pee wee hockey team?) Within 15 minutes, we had collected our bags, were through customs- all the while I am just slightly worried that they will eyeball my “Glo Germ- Hand Sanitizer Training Kit” ( stay tuned for more on this later) and pull us into a side room for a deep interrogation! But, no, even after being randomly selected for a deeper search, we were out of there in a flash. Pedro, the driver sent from our hotel, was waiting for us at the gate and whisked us off down ( and as the saying goes- everything is downhill from here, but in a good way) about 1500 feet, just south of centre of La Paz, an area called Sopocacachi. 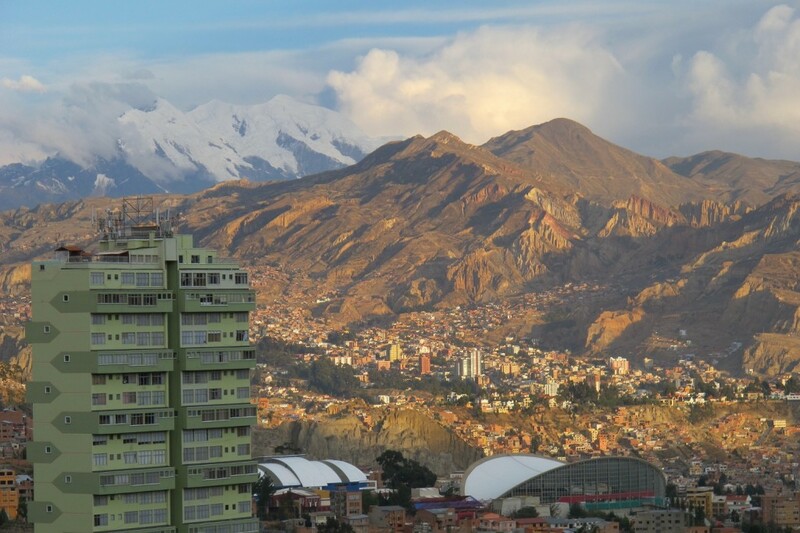 Spectacular is hardly the term I would use to describe the views of mountains, valleys, rock formations and sprawling city you see on your way into La Paz. Every time I would get the window open on one side of the taxi to get shot, Doug would yell, ‘Al, check this out, you have to get a picture out this side!” Unbelievable. The owner of our hotel/B&B, The Rendezvous, was waiting at the door and led us to our room where we immediately crawled into bed and slept for three hours. After checking out the unbelievable views from our window, it was straight to breakfast in the hotel’s café, la Cava. Delicious Bolivian coffee and pancakes and off to explore our neighbourhood with only slight headaches and a pocketful of drugs to keep the pulmonary edema at bay, should it make an appearance! 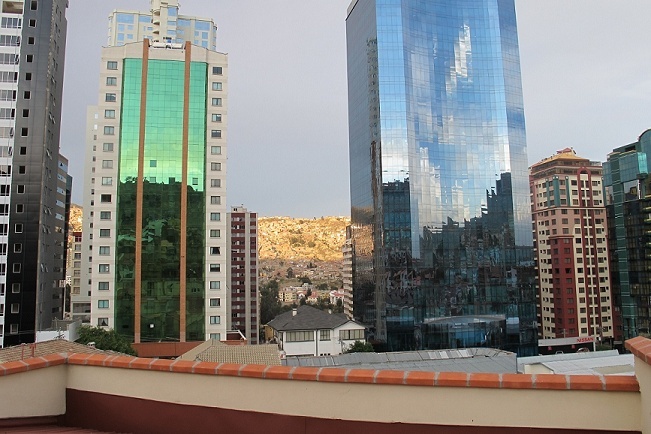 Modern sky-scrapers frame the sprawling Aymara city of El Alto.